It takes a lot of work to make a dream into a reality. 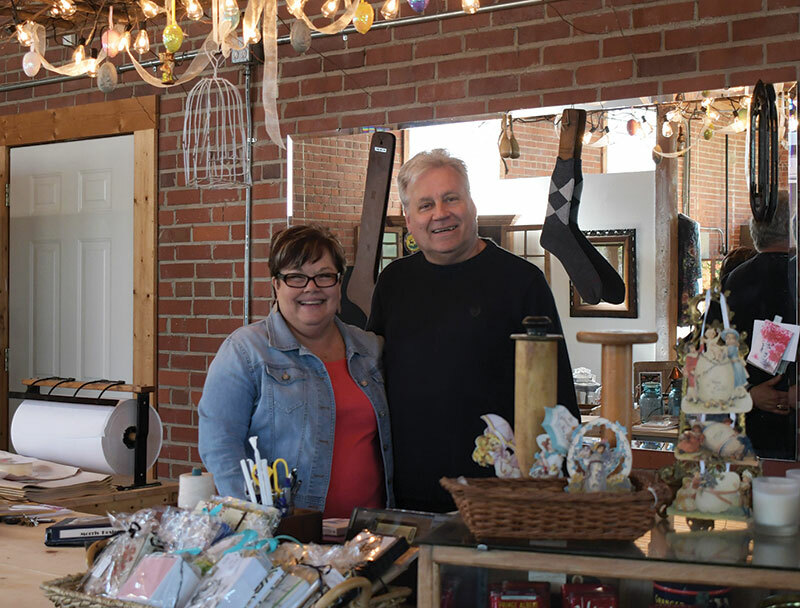 Just ask Robin Hunt and Greg Owen, who on Wednesday will open the doors on a passion project they’ve turned into a business venture: The Shoppe at Morris Mills. The motivation behind this venture is to bring upscale retail shopping back to Denton. Both Robin and Greg have many years experience in antiques, collectibles, and fine gifts and look forward to sharing their expertise with the Denton community. The shoppe will exquisitely combine old and new items with each display taking full advantage of the natural light coming through the large windows. The shoppe offers unique gifts that Robin and Greg have spent the majority of their lives collecting. The building was formerly a hosiery mill producing socks. The exposed wooden beams, authentic hardwood flooring, along with the original black pipe sprinkling system add an element of charm to the building. Both Robin and Greg are excited to have secured this particular building for their new business. In fact the building is what brought the two together. Both expressed interest in the building and when they found out about the others interest they decided to combine forces and go in together. The shoppe is filled with a lot of paintings, NC pottery, baskets, oil lamps, vintage jewelry, American Majolica, antiques, vintage toys, soaps, lotions, and oils and so much more. “We wanted something for everyone,” they said, and with that in mind, they’ll have the fare a shopper might expect at an upscale country/vintage market — older furniture, hand-painted items, knickknacks from decades past, and intricate floral arrangements. Greg plans on selling his fresh flowers at this location as well. The shoppe will be open Wednesday through Saturday from 10-6, and Sunday from 1-5. However the shoppe will not be open this Sunday in lieu of Easter. Robin and Greg invite the entire Denton community to join them as they open the doors of The Shoppe at Morris Mills today located at 38-B North Main Street, Denton, NC. Due to rain last week, the Egg-stravaganza in Harrison Park a fun filled, FREE event for all the local children is scheduled for Saturday, April 20 from 12-2pm. Activities will include: Egg Drop, Egg Hunt for the little ones, Egg Decorating, Face Painting, Egg Relay and Egg Toss, Egg/Prize Trade in Booth, and of course the Easter Bunny will be there for pictures! NEW for 2019 is the inclusion of a Bounce House, sponsored by the Town of Denton Parks and Recreation, for the children’s enjoyment, plus New Signage for each of the Stations. 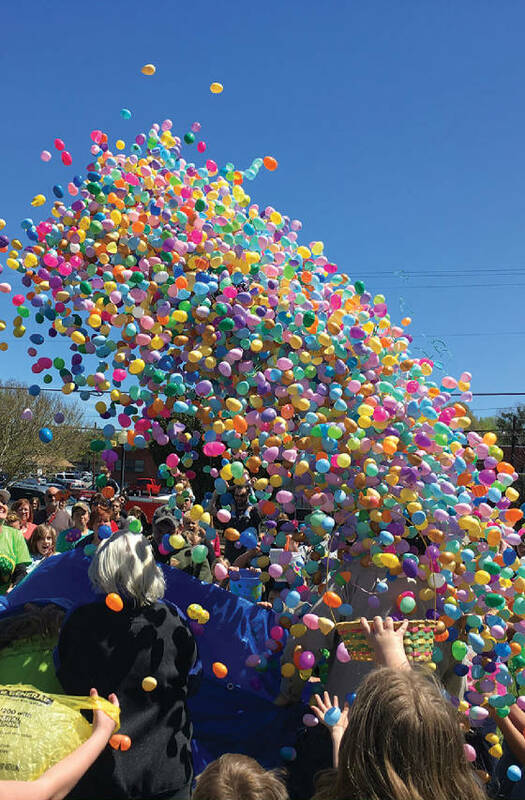 Once again this year the eggs will drop from the sky with assistance from the Silver Valley and Denton Fire Departments. The egg drop is for children 5 and up. The egg drop will begin promptly at 12:30 p.m. Over 5,000 eggs will be dropped into Harrison Park that children will exchange for prize bags. Every child participating in the egg drop will receive an Easter Goody Bag regardless of how many eggs they collect. Once again this year for ages 4 and under eggs will be hidden in the playground area of Harrison Park for the children to hunt. They will also receive a prize bag. Egg-stravaganza would not be possible without the generous support of area churches.